Here is a fabulous multiple crinoid plate from Gilmore City, Iowa. This classic location has been closed to collecting for a number of years, ever since some drunken fool drove his car over the wall of the quarry. The plate has seven crinoids preserved (6 Dichocrinus multiplex and one Cercidocrinus cirrifer). ALL of the crinoids are beautifully displayed, with stems present on many of the crinoids. 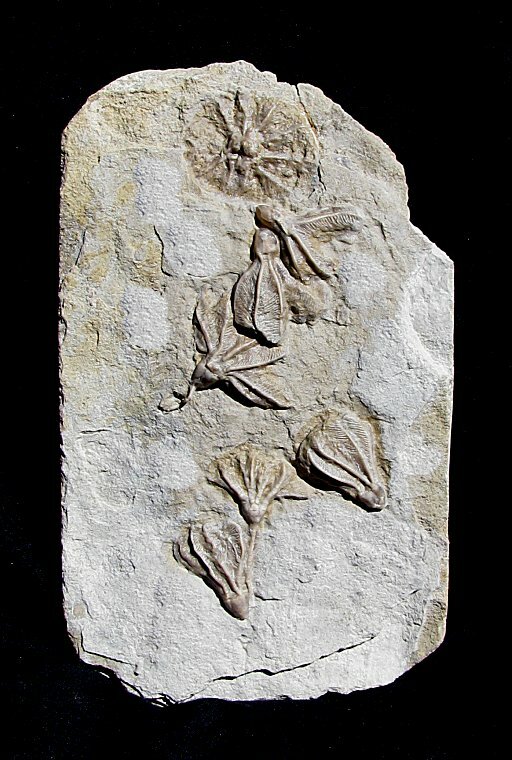 The fossil echinoderms have great natural color and contrast and are beautifully showcased on the large plate of limestone. This is a very nice, collectible crinoid multiple from a classic locality that is now closed to collecting.